Three years ago, the first Friday of October 2010, I joined French Fridays with Dorie for its inaugural post, Gougeres. There is no way that I could have know where that journey would take me. Over the past three years, I’ve improved my cooking skills, discovered many new favorite recipes, and introduced them into my kitchen’s repertoire. Most importantly, I’ve made new friends from around the world who share my passion for food and cooking. Two weeks ago, I had the great pleasure of meeting about a dozen of them, along with Dorie Greenspan, at IFBC in Seattle. Today, the first Friday of October 2013, marks the start of Year #4 that this group continues to cook our way through Dorie Greenspan’s book Around My French Table. To mark the occasion, this week’s choice is the classic Salad Niçoise. Salad Niçoise is overflowing with Mediterranean flavors. I’ve made different versions of this salad over the years, and it never disappoints. Dorie’s version is no exception. In this version, you start with a bed of soft lettuce and shallots tossed with some vinaigrette. Next, you practice your artistic skills and arrange tuna, tomatoes, green beans, potatoes, and hard-boiled eggs on top. Sliced olives (Kalamata, for me) and capers are scattered on top, the eggs are decorated with anchovy fillets, more vinaigrette is poured, and everything gets a sprinkle of fresh parsley. The various parts of this make it a little time-consuming to make, but if you plan ahead, mixing the dressing and cooking the beans, eggs, and potatoes a day or two ahead, the final assembly is a snap. The presentation is impressive, and the flavor is too. The salad makes a hearty meal. I served it for dinner accompanied only by a loaf of bread. We didn’t finish the half-recipe I made for dinner, but it held up for a lunch of leftovers the next day. It made me happy to realize that except for the green beans (which just ended last week), all the vegetables came from my farm share. That said, this salad would be delicious any time of year, whenever a dose of Southern French sunshine is required. Happy Anniversary to my fellow Doristas! I’m raising a glass to toast you all to kick off the next year of French Fridays. 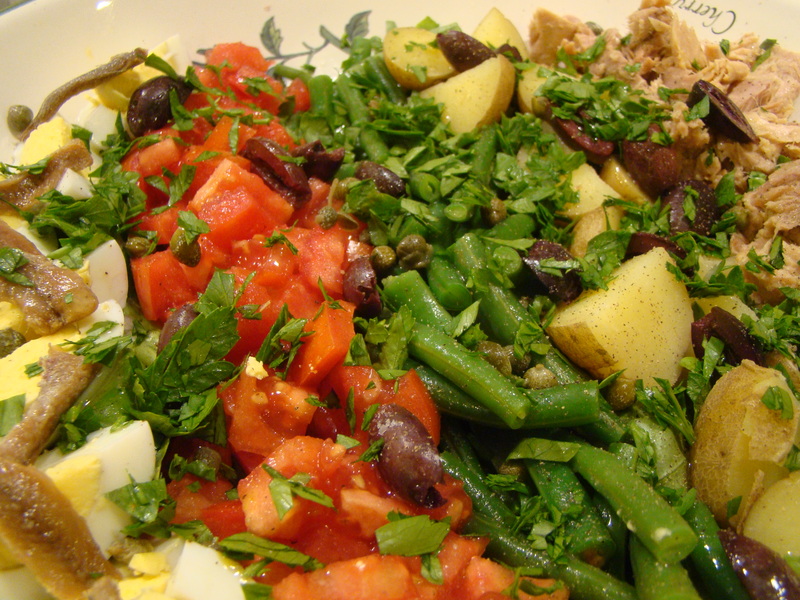 To read about the other Doristas’ Salads Niçoise, find their links here.